On Mechanical Turk people complete small tasks that humans perform more efficiently than computers—image processing, data cleaning, data processing, and online social science surveys. In this blog, we provide a snapshot of MTurk workers as part of the gig economy. More specifically, we report how many hours per week workers tend to spend on the platform, where workers prefer to work, and how MTurk fits into their work life. How Many Hours do Workers Spend on MTurk? Mechanical Turk advertises itself as a place for people to make money in their spare time. To understand how much time MTurk workers devote to working on the platform, we asked 700 workers how many hours they spend on MTurk per week. 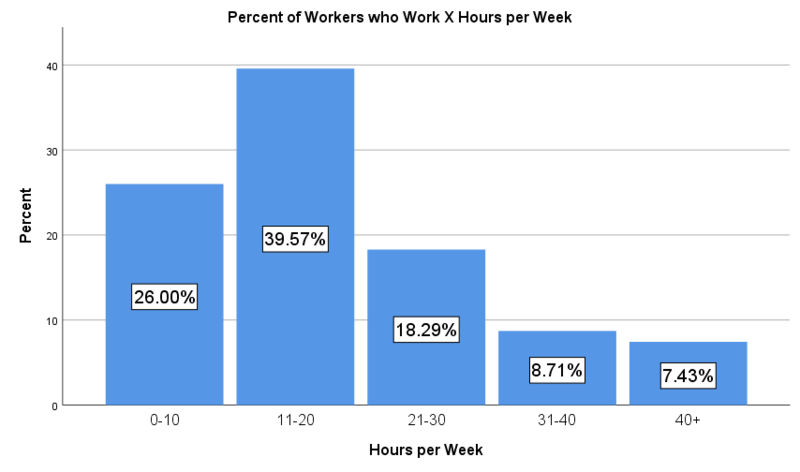 Most participants in our sample (67.5%) said they spend 20 hours or less on Mechanical Turk per week (see Figure 1). Another 18% of the sample reported spending between 21 and 30 hours and about 16% of people said they spend more than 30 hours per week. Thus, while there is clear variability, a majority of people report using Mechanical Turk for less than 20 hours a week. This finding is consistent with previous research from the Pew Research Center, which found that a majority of workers report spending time on MTurk every day, but not for more than 20 hours per week (Hitlin, 2016). Figure 1: The number of hours workers spend on MTurk per week. Where do Mechanical Turk Workers Work? One attractive feature of Mechanical Turk is that people can work from home or anywhere else that has internet access. We asked 1,034 workers in which location they spend most of their time when on MTurk. A strong majority of people reported working from home (see Figure 2), an unsurprising result given the convenience of the MTurk platform. Interestingly, nearly 20% of people reported working on Mechanical Turk while at another job. Few people reported working on Mechanical Turk while in public spaces like a coffee shop or library and just one person said they spend most of their time on MTurk while commuting. Figure 2: Where workers work from while on MTurk. How Does MTurk fit with Other Work? As a final question, we asked 1,272 workers why they work on MTurk. Our goal was to understand how MTurk fits into people’s work life (e.g., part-time job, full-time job, leisure activity). The results show that most people rely on MTurk as either a form of paid leisure (28%) or a part-time job (56%) (see Figure 3). Only 15% of people said that MTurk is a full-time job. These results largely align with previous work by the Pew Research Center asking people whether MTurk is a primary or secondary source of income (Hitlin, 2016). However, the number of workers who say Mechanical Turk is simply a way to earn money in their leisure time has not been previously documented to the best of our knowledge. Figure 3. How MTurk fits with Workers work life. What Percentage of HITs do these Workers Complete? The final thing we investigated was what percentage of HITs are completed by workers who state different motives for working on MTurk. Theoretically, workers who say they pursue MTurk as a full-time job might be expected to complete more HITs than those who say they work on MTurk as a form of paid leisure. To find out what percentage of HITs were completed by workers in each group, we queried the TurkPrime database. Bear in mind, the total number of HITs completed in this analysis was based on the 1,272 people who answered our question, not all HITs on MTurk. As shown in Table 1, workers from each group completed a share of HITs roughly equal to their size of the worker pool. For example, workers who said they work on MTurk as a form of paid leisure represented 28.38% of all workers and completed roughly 25% of all HITs. These results suggest that none of the groups included in our analysis completed a disproportionately high or low number of HITs. Mechanical Turk is part of the gig economy and the work habits of people on the platform largely reflect that. Most workers in our polling said they spend 20 hours or less per week on Mechanical Turk, that they work from home, and that MTurk is a source of paid leisure or a part-time job. At the same time, however, there is a sizeable group of people who reported that Mechanical Turk is a full time job and that they spend 40 hours or more per week working on the site. The differences between these groups represent an interesting direction for future research to explore how much workers earn and how satisfied they are with the time spent on Mechanical Turk. The survey results we report are based on a non-probability sample of US-based Mechanical Turk workers. The data were collected over two days in March 2019 using TurkPrime’s qualification system.